Jessica & Kurt first came to the Trilogy Weddings team already with a vision in mind for their dream destination island wedding. 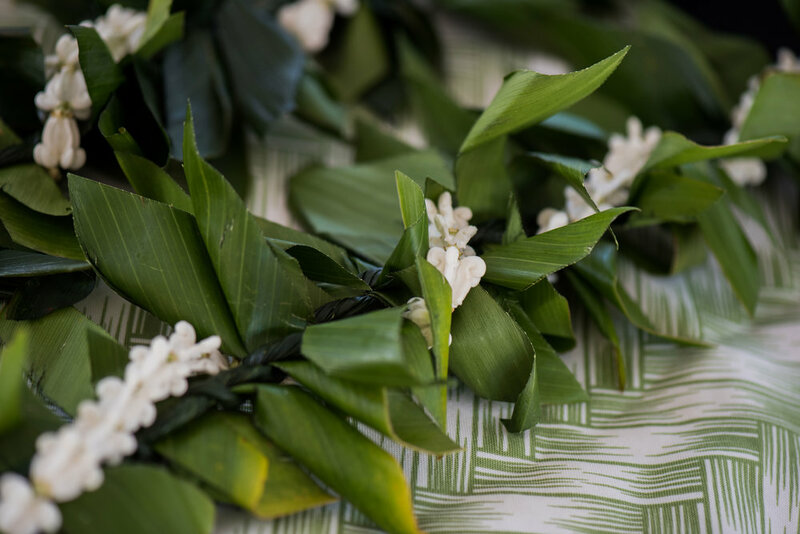 The family of the groom, Kurt, has a history of Hawaiian roots, so it was vital for the couple to incorporate traditional Hawaiian elements into their big day, with a compliment of bright, tropical color pops. 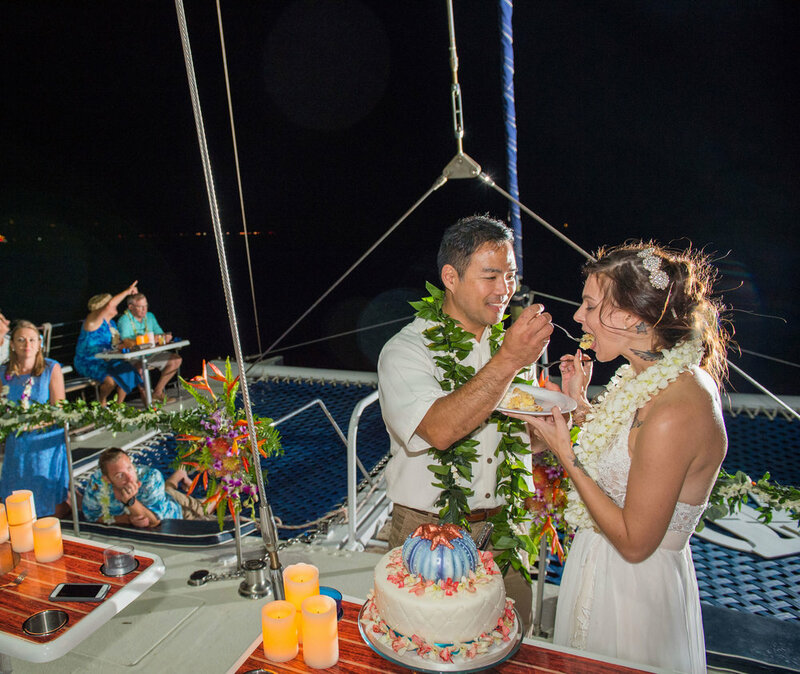 Their dream-day vision was to host an intimate & personal ceremony at sea for their family & closest friends, followed by an elegant, Chef-prepared fine dining experience. 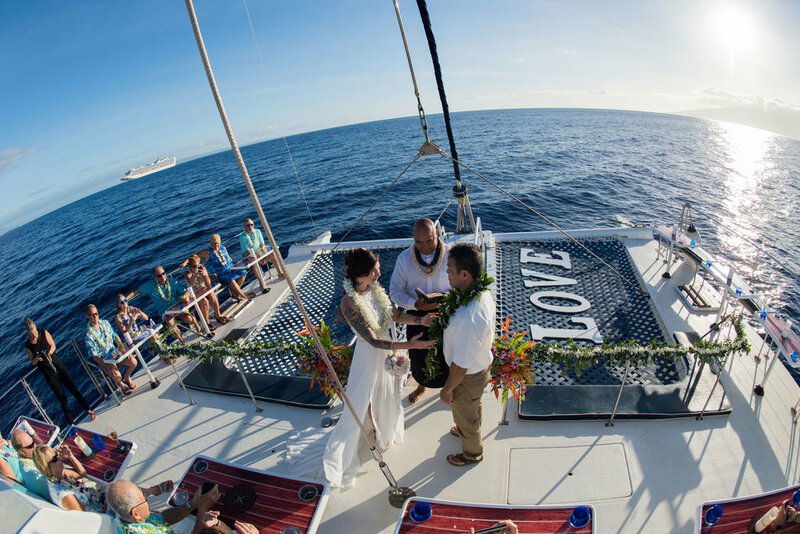 After Jenny began the coordination, they selected TRILOGY I as the perfect catamaran to hold the couple’s beautiful ceremony and 4-course dinner. 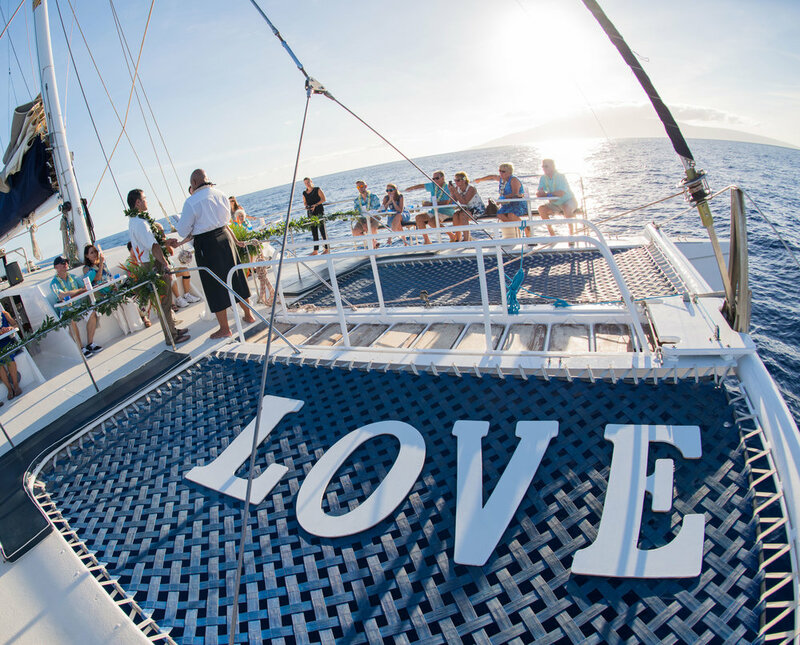 Trilogy I is a first-class 64-foot Cutter Rigged sailing catamaran, complete with covered cabin, forward netting ideal for a fun ride, and cushioned seating both inside & out - a perfect combination for guests to dance, dine in comfort, and end the day in front of a serene Maui sunset. Once the vessel was selected, it was time to nail down all the little touches that would truly make Jessica & Kurt’s wedding unique and decidedly Hawaiian. Selecting a modern tropical theme with a nautical flair, the team went to work on finding the perfect vendors to bring the couple’s style to life. And now for the big day! 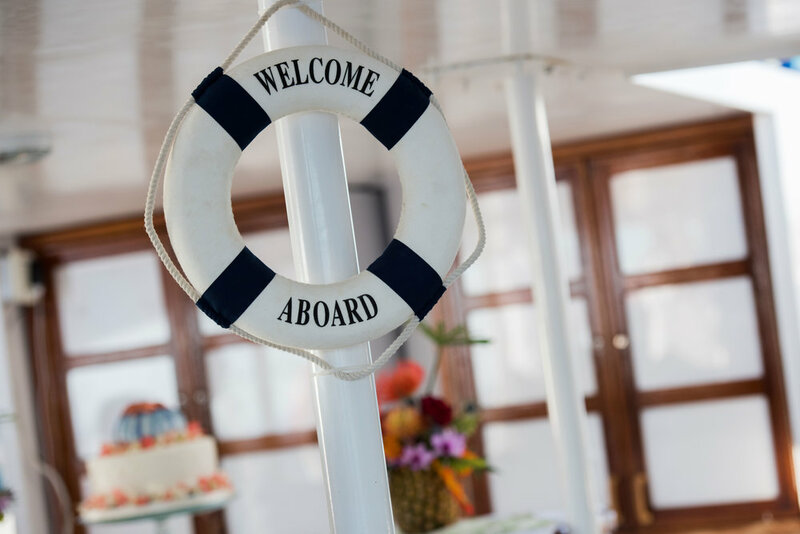 Boarding the catamaran, guests were delighted at the bright, free-flowing tropical floral arrangements that adorned the bow, full of playful colors including fuchsia, orange, purple, and green, while full, leafy upcountry eucalyptus wrapped elegantly along the railings. Maui-grown orange and yellow Pincushions combined with fiery orange Birds of Paradise and purple Orchids were expertly arranged by the local florist, Petals, selected by the couple. The perfect Hawaiian touch for their ceremony? A fresh-cut Plumeria lei for Jessica, complimented by a green Maile-style Ti leaf lei for Kurt. All together, the florals, greenery, and custom leis effortlessly created a stunning backdrop for the couple’s on-deck ceremony. 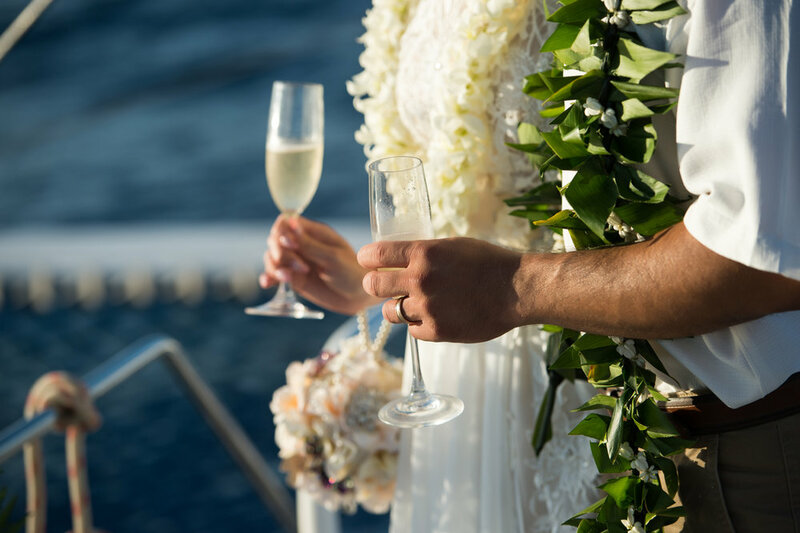 And to their Hawaiian experience, the Trilogy team recommended the company’s long-time friend and kupuna from the small neighboring island of Lana'i, Uncle Mike Lopez, to officiate the couple’s traditional vow exchange. 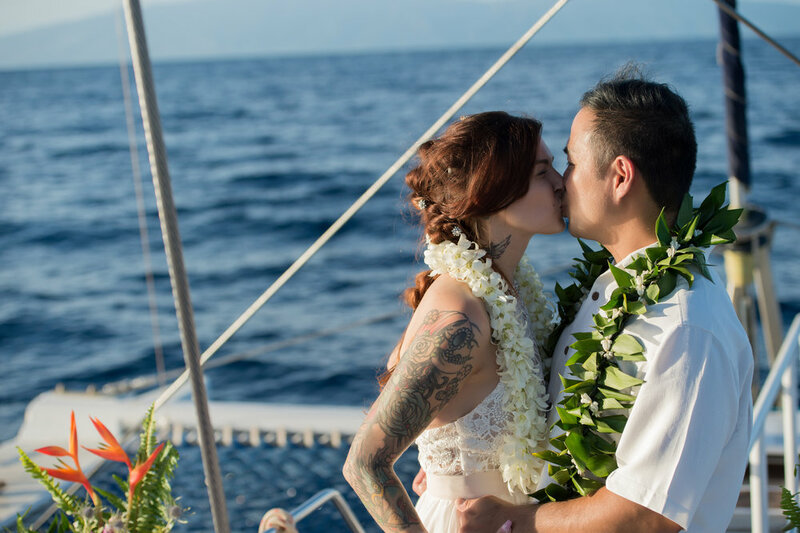 After the vows, Hawaiian elements continued to infuse seamlessly with Jessica & Kurt’s celebration, as local musician Bu Makanani's smooth island tunes captivated the group. Guests were at ease and full of island vibes as they danced to the sounds of the ukulele, mingling on deck and raising their glasses in a champagne toast to the newlyweds. While the happy bride & groom danced away with their guests, our on-board catering team began preparations for the gourmet 4-course dinner in the cabin below deck. Guests sat down at the cozy, intimate seating located around the bow, and our 5-star service team began serving the custom menu that our expert Trilogy wedding coordinators had designed with Jessica & Kurt (see below for full menu). Main entrées were served next to eco-friendly reusable candles, creating the perfect island mood, as the sunset transformed the sky from bright blue to deep hues of purple and pink. For dessert, the bride & groom cut into a custom-ordered nautical themed cake by Cake Fanatics, with fresh flower accents delicately placed in rings around each layer, and a sculpted ocean-blue shell & orange starfish topper. To add that extra splash of seaside charm, Jenny also set up a “message-in-a-bottle” style guest book, where guests could leave advice for the newlyweds, giving them the perfect memento to bring home from their gorgeous Maui wedding day. Throughout the sail, ceremony, dancing & dinner, the truly talented photography team from Creative Island Visions were alongside this beautiful bride & groom, offering an exquisite attention to detail in capturing both traditional shots as well as romantic, candid moments that they will look back on for countless years to come! Huli pau, Jessica & Kurt!